Homelessness and depression dominated many years of Lisa Williams’ life. When Williams was 12, her grandmother died and she lived with aunts, uncles and her parents off and on until graduating high school. After graduation, Williams couch-surfed, but never dealt with her depression. In the first apartment she was able to rent, she attempted suicide and landed in a mental health institution. “That was the first time I ever felt at home,” she said of the institution. Williams’ story was one of three showcased at the “Housing in Milwaukee as a Public Health Issue” event, which was attended by 150 community members. 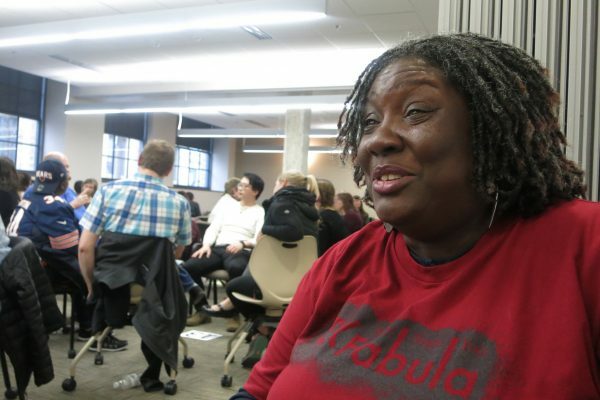 The event was co-hosted by Ex Fabula, which focuses on building community connections through storytelling, and the Zilber School of Public Health at the University of Wisconsin-Milwaukee.